Dual Monitor Mount is a fixing arm made which is useful for mounting LCD Monitor on to the Wall or Desk, which is called as Monitor Mount. There are different types of Dual monitor mounts with different capacity and sizes which suite to hold the Single / Multiple Monitors. This blog entry says about the Dual Monitor Mount briefly and talks about advantages and lists few Dual Monitor mounts. Mounting Dual Monitors on mounts can have advantages of saving space, ability to move monitors in desired directons, ability to rotate the monitor to view the monitor contents in landscape or portrait view, giving a good look, etc. There can be other advatages of mounting monitors on walls depending on the area available and usage of the monitors. Given below list of dual monitor mounts can give you an idea about weight, dimensions of the mount, capacity to hold single or dual monitors, etc. Price range can vary a lot and a rough price range can be from more or less $300 to $600 depending upon the brand name, size and design. Dual Monitor Mounts can be really useful in small or a big space. Example uses may be to mount computer monitor on wall in a business establishmet to continously display news, stock exchange related information or for can be used in houses with big rooms to give enough space for other household goods when mounted on a suitable wall. The Monitor Mounts can also add a little bit of safety to the monitor physically, but obviously it depends on various other factors as well. A Mount holding dual monitors can be used to add safety to your dual monitors and can allow you to enjoy full benefits of having dual monitors connected to your computer. Dual Monitors or one Big Monitor ? 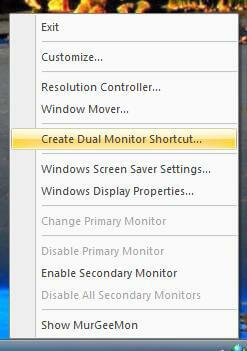 Multi Monitor Software needed on Windows 8 ? MurGeeMon Presentation in Power Point Format. Visit Home page of Dual Monitor Hardware and Software Website.